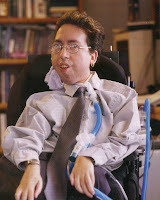 Paul Glatzer is a 28-year-old from New York who has Down syndrome. He works at a nursing home cafeteria and loves his job. He loves Elvis and Celine Dion. He competes in Special Olympics as a powerlifter (dead lift and bench press) and bowler, and is known by the nickname "Pauly Greensocks" because of his lucky green socks. His favorite shows are wrestling, American Idol, and Dancing with the Stars. He loves to flirt with pretty ladies and to make people laugh. At parties, he's on the dance floor all night. People call him "the mayor" because he seems to know everyone in town. You can visit him at his blog, Absolute ElvisPaul. 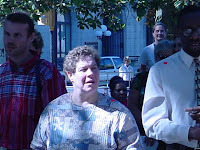 Karen is the Executive Director of the Association of Self Advocates of N.C., Inc. She's an actress & a board member for a inclusive theater company, Raleigh Ensemble Players and she's currently writing her autobiography, "I'm not Disabled, I'm just a little Inconvenience", as well as a play "Soldiers of Empowerment". Karen is on many boards & committees in her community. She's been married for 9 years and she loves to travel. Karen will be contributing posts in a column she is calling "Focusing on Abilities." Photo description: Karen is outside. The sun is shining on her face but she appears to be standing in the shade under some trees. There are people surrounding her; it appears she may be at an event of some kind. She has short curly hair and is wearing a print blouse. Ruth Harrigan is an attorney with a B.A. from Rutgers College and a J.D. from Wayne State University. She is a member of the NJ Coalition for Inclusive Ministries and started her blog Wheelie Catholic to raise awareness of the need for inclusion of people with disabilities. Ruth also writes essays and fiction about disability issues at her blog, A Different Light. Ruth enjoys skiing and was nationally ranked as a wheelchair tennis player. Bob Lazzari is an award-winning sports columnist for Connecticut's Valley Times and NY Sports Day; he also contributes a daily sportscast to SportingNewsCT.com and is a member of the Connecticut Sports Writers' Alliance. He will be editing Jamie Lazaroff's column on a regular basis while occasionally adding some material of his own. Jamie Lazaroff is an aspiring sportscaster who has reported for television extensively for Special Olympics International and CT, covering events that include the Special Olympic World Games, for which he received a 1995 New England EMMY nomination. He has also co-hosted several cable television shows in Connecticut. In addition, Jamie was actively involved in the Special Olympics Global Messenger Program through which he trained other athletes for the Special Olympics and speaking engagements. Michael A. Harris is a prominent disability advocate and the founder and executive director of the Disabled Riders Coalition, the tri-state area's only disability advocacy organization focused solely on transportation issues. His work as an advocate has won him international recognition and he makes frequent appearances on local, national and international media. Michael also works as a freelance writer and photographer and has had his work published in amNewYork, Courier Life, Able News and the Brooklyn Daily Eagle. He is currently employed part-time in the office of New York State Assemblyman Micah Z. Kellner. Michael is a recent graduate of Manhattanville College, where he majored in political science and journalism. Connie Kuusisto has worked for over twenty years in the world of guide dogs and their blind partners, first as a Trainer/Instructor, then as Manager of Admissions at Guiding Eyes for the Blind, one of the premier guide dog training programs in the United States. She co-founded, with her husband Stephen Kuusisto, Kaleidoscope Connections, a resource for bringing people together to help promote disability awareness. Together they've worked with a wide range of businesses, including Sandals and Beaches resorts in Jamaica, where they've given workshops on customer service for people with disabilities. You can visit Connie and Steve on their blog: Planet of the Blind. Dr. Scott Rains, Senior Advisor, [with]tv as well as Executive Producer, Catching the 9:05 [with]tv, is also editor of Rolling Rains Report, a website for dialogue on travel, disability, and universal design. Dr. Rains holds a B.A. in Linguistics from the University of Washington, an M.A. in Pastoral Ministry from Seattle University, and a D. Min. in Pastoral Ministry from the Graduate Theological Foundation in South Bend, Indiana. Photo is of a smiling Scott Rains. He's wearing a casual white button down shirt. Black background. He sports a tidy salt&pepper beard and mustache.